First published in 1957, Nathan Glazer's classic, historical study of Judaism in America has been described by the New York Times Book Review as "a remarkable story . . . told briefly and clearly by an objective historical mind, yet with a fine combination of sociological insight and religious sensitivity." Glazer's new introduction describes the drift away from the popular equation of American Judaism with liberalism during the last two decades and considers the threat of divisiveness within American Judaism. Glazer also discusses tensions between American Judaism and Israel as a result of a revivified Orthodoxy and the disillusionment with liberalism. Biblical texts create worlds of meaning and invite readers to enter them. When readers enter such textual worlds, which are strange and complex, they are confronted with theological claims. With this in mind, the purpose of the IBT series is to help serious readers in their experience of reading and interpreting by providing guides for their journeys into textual worlds. The focus of the series is not so much on the world behind the text as on the worlds created by the texts in their engagement with readers. Nowhere is the world of the biblical text stranger than in the apocalyptic literature of both the Old and New Testaments. In this volume, Stephen Cook makes the puzzling visions and symbols of the biblical apocalyptic literature intelligible to modern readers. He begins with definitions of apocalypticism and apocalyptic literature and introduces the various scholarly approaches to and issues for our understanding of the text. 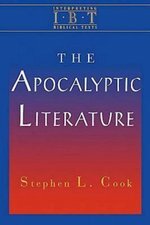 Cook introduces the reader to the social and historical worlds of the apocalyptic groups that gave rise to such literature and leads the reader into a better appreciation and understanding of the theological import of biblical apocalyptic literature. In the second major section of the book, Cook guides the reader through specific examples of the Bible's apocalyptic literature. 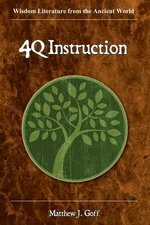 He addresses both the best-known examples (the biblical books of Daniel and Revelation) and other important but lesser known examples (Zechariah and some words of Jesus and Paul). The world of apocalyptic literature can be both vast and confusing. To journey successfully through its complexities, it is best to have an experienced tour guide to direct you to the sites most representative of that world. In this way the new traveler can avoid dead ends, skip the fruitless excursions, and instead enjoy the ride. Reddish's introductions to the otherworldly writings of Judaism" including the "War Scroll" from Qumran and books such as "1 Enoch" from the so-called Old Testament Pseudepigrapha" as well as to the apocalyptic documents of Christianity, including the noncanonical apocalypses of Peter, Paul, and James, and related works such as the "Sibylline Oracles," are simply superb. 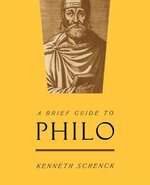 Those wanting a more informed understanding of these centuries-old writings of hope and despair will not be disappointed. "Reddish's selection limits the corpus to a range that can be covered in an undergraduate course. Charlesworth's "[Old Testament Pseudepigrapha]" edition will remain indispensable for the scholar and specialized student, but Reddish's presentation is surely more accessible to the nonspecialist." 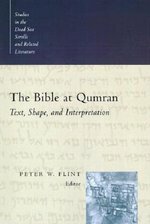 The Bible at Qumran puts the Dead Sea Scrolls to use in exploring two principal themes: the text and shape of the -Bible- at Qumran and the interpretation of these scriptures in this fascinating Jewish community. Written by leading scholars in the field, these informed studies make an important contribution to our understanding of the biblical text at a pivotal period in history. Here is the second of three volumes (the first, Revelation: The Torah and the Bible, was published in 1995) whose purpose is to compare and contrast the paramount theological categories of Judaism and Christianity. The volumes provide the faithful of both Judaism and Christianity with informative, factual accounts of how Judaism and Christianity addressed the same issues and set forth their own distinctive program and set of propositions. While religions speak to individuals in the privacy of their hearts, they also define themselves through social entities such as "church," "holy people," "nation of Islam," "kingdom of God." In this book, Professors Neusner and Chilton bring reader to a consideration of "Israel" in Judaism and Christianity. When Jews call themselves "Israel," their initial claim is that they constitute the "Israel" to whom God gave the Torah. All of those who inherit these Hebrew scriptures, specifically Christians, also claim to form an "Israel" because they receive these scriptures. Individual chapters in part one deal with Israel in the theology of Judaism, Israel as a kingdom of priests and holy nation, Israel as family, and Israel as (Christian) Rome. Part two examines Jesus and the absence of Israel; the Israel of James, the community of "Q" and Peter; and the church (ekklesia) in the Synoptic Gospels, Paul, Hebrews, and Revelation. 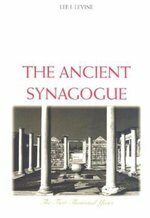 The volumes in this series are excellent resources for all who wish to deepen their understanding of Judaism and Christianity and the relationship between these two great traditions. Jacob Neusner, leading scholar of the formative age and writings of Judaism, is Distinguished Research Professor of Religious Studies at the University of South Florida, Tampa. Bruce D. Chilton, New Testament and Judaic scholar, is Bernard Iddings Bell Professor of Religion at Bard College, Annandale-on-Hudson, NY. 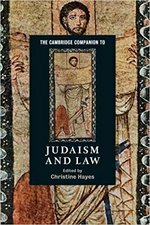 The Cambridge Companion to Judaism and Law explores the Jewish conception of law as an essential component of the divine-human relationship from biblical to modern times, as well as resistance to this conceptualization. It also traces the political, social, intellectual, and cultural circumstances that spawned competing Jewish approaches to its own 'divine' law and the 'non-divine' law of others, including that of the modern, secular state of Israel. Part I focuses on the emergence and development of law as an essential element of religious expression in biblical Israel and classical Judaism through the medieval period. Part II considers the ramifications for the law arising from political emancipation and the invention of Judaism as a 'religion' in the modern period. Finally, Part III traces the historical and ideological processes leading to the current configuration of religion and state in modern Israel, analysing specific conflicts between religious law and state law. Elie Wiesel is a consummate storyteller, commentator on classic Jewish texts, human rights activist, university professor, and winner of the Nobel Peace Prize. Celebrating Elie Wiesel presents stories, essays, and reflections that celebrate his extraordinary literary, moral, religious, and human rights contributions. 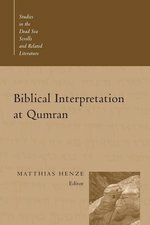 A Companion to Biblical Interpretation in Early Judaism presents eighteen commissioned articles on biblical exegesis in early Judaism, covering the period after the Hebrew Bible was written and before the beginning of rabbinic Judaism. The essays, all written by experts in the field, are arranged in seven categories: Hebrew Bible, Rewritten Bible, Qumran Literature, Apocalyptic Literature and Testaments, Wisdom Literature, Hellenistic Judaism, and Biblical Interpretation in Antiquity. 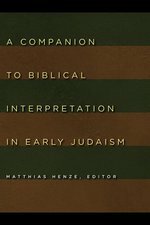 Together these essays provide a systematic and comprehensive introduction to the diverse modes of scriptural interpretation practiced by a variegated and dynamic spectrum of Jewish groups in the Hellenistic and early Roman eras. In this brilliantly researched and insightful book, psychologist Eva Fogelman presents compelling stories of rescuers of Jews during the Holocaust--and offers a revealing analysis of their motivations. Based on her extensive experience as a therapist treating Jewish survivors of the Holocaust and those who helped them, Fogelman delves into the psychology of altruism, illuminating why these rescuers chose to act while others simply stood by. While analyzing motivations, "Conscience And Courage" tells the stories of such little-known individuals as Stefnaia Podgorska Burzminska, a Polish teenager who hid thirteen Jews in her home; Alexander Roslan, a dealer in the black market who kept uprooting his family to shelter three Jewish children in his care, as well as more heralded individuals such as Oskar Schindler, Raoul Wallenberg, and Miep Gies. Speaking to the same audience that flocked to Steven Spielberg's Academy Award-winning movie, "Schindler's List," "Conscience And Courage" is the first book to go beyond the stories to answer the question: Why did they help? "Fogelman has made a monor contribution to Holocaust studies in collcting these accounts of conscience and courage." -- "The Washington Post Book World." "By evoking the noble along with the horrible, Ms. Fogelman helps to add a dimension to our understanding of the Holocaust. And, more than that, hers is a work of remembrance." -- "The New York Times Book Review"
A vivid history of the American Jewish merchants who concentrated in the nation's most important economic sector In the nineteenth century, Jewish merchants created a thriving niche economy in the United States' most important industry--cotton--positioning themselves at the forefront of expansion during the Reconstruction Era. Jewish success in the cotton industry was transformative for both Jewish communities and their development, and for the broader economic restructuring of the South. Cotton Capitalists analyzes this niche economy and reveals its origins. Michael R. Cohen argues that Jewish merchants' status as a minority fueled their success by fostering ethnic networks of trust. Trust in the nineteenth century was the cornerstone of economic transactions, and this trust was largely fostered by ethnicity. Much as money flowed along ethnic lines between Anglo-American banks, Jewish merchants in the Gulf South used their own ethnic ties with other Jewish-owned firms in New York, as well as Jewish investors across the globe, to capitalize their businesses. They relied on these family connections to direct Northern credit and goods to the war-torn South, avoiding the constraints of the anti-Jewish prejudices which had previously denied them access to credit, allowing them to survive economic downturns. These American Jewish merchants reveal that ethnicity matters in the development of global capitalism. Ethnic minorities are and have frequently been at the forefront of entrepreneurship, finding innovative ways to expand narrow sectors of the economy. While this was certainly the case for Jews, it has also been true for other immigrant groups more broadly. 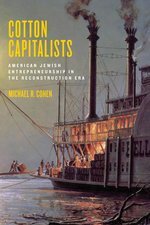 The story of Jews in the American cotton trade is far more than the story of American Jewish success and integration--it is the story of the role of ethnicity in the development of global capitalism. 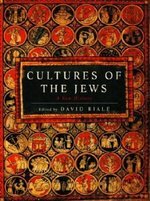 To address these and similar questions, twenty-three of the finest scholars of our day--archaeologists, cultural historians, literary critics, art historians, folklorists, and historians of relation, all affiliated with major academic institutions in the United States, Israel, and France--have contributed their insight to Cultures of the Jews. 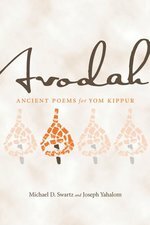 The premise of their endeavor is that although Jews have always had their own autonomous traditions, Jewish identity cannot be considered immutable, the fixed product of either ancient ethnic or religious origins. Rather, it has shifted and assumed new forms in response to the cultural environment in which the Jews have lived. 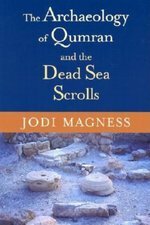 The Dead Sea Scrolls from Qumran provide the oldest, best, and most direct witness we have to the origins of the Hebrew Bible. 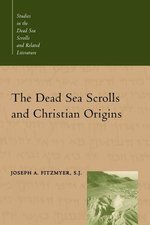 Prior to the discovery of the Scrolls, scholars had textual evidence for only a single, late period in the history of the biblical text, leading them to believe that the text was uniform. The Scrolls, however, provide documentary evidence a thousand years older than all previously known Hebrew manuscripts and reveal a period of pluriformity in the biblical text prior to the stage of uniformity. 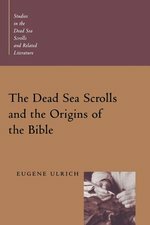 In this important collection of studies, Eugene Ulrich, one of the world's foremost experts on the Dead Sea Scrolls, outlines a comprehensive theory that reconstructs the complex development of the ancient texts that eventually came to form the Old Testament. Several of the essays set forth his pioneering theory of "multiple literary editions," which is replacing older views of the origins of the biblical text. 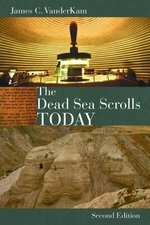 The Dead Sea Scrolls and the Origins of the Bible represents the leading edge of research in the exciting field of Scrolls studies.